On a very dull Tuesday afternoon I thought I’d brave the cold wind and walk across the field to the allotment. On went the woolly hat, quilted coat (over three layers) and the wellies. Unsurprisingly I had the allotment to myself – not another mad gardener in sight. I set about emptying one of the compost bins, and spreading the contents (a hand’s width deep) over a metre wide stretch of ground that had been cleared of over-wintering sprouts and broccoli. It seemed a good day to do it, and I was glad I had prised myself from the house. This year I’m experimenting with the ‘no dig’ system of cultivation, so apart from tweaking out one or two noxious weeds, I resisted the temptation to get out my favourite spade. The objective is to cover the soil with enough interesting organic matter to excite the worms in the soil below. 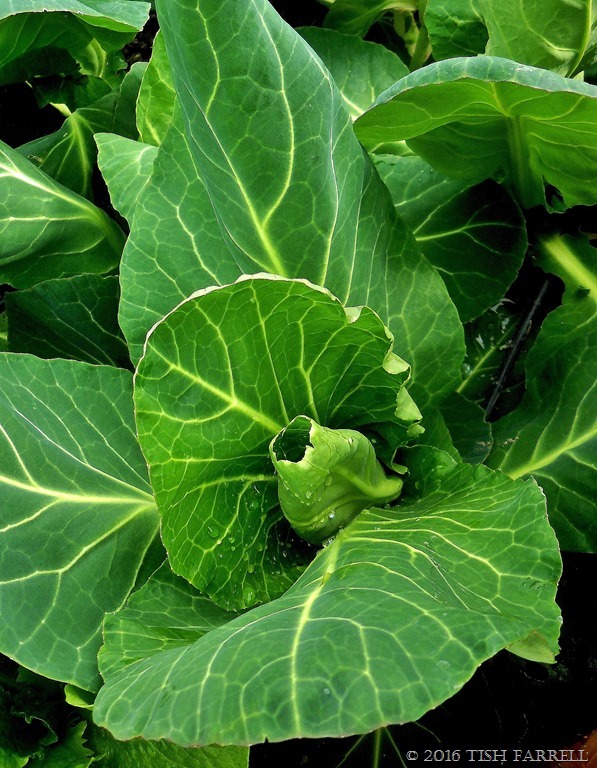 They then do the digging, and other soil-friendly organisms get going too so that, hopefully, the later seasons’ crops – cabbages and sweet corn – can be planted out on the much improved, and better nourished ground. I was thus in the middle of this very absorbing activity when someone upstairs switched off the lights and I turned to find a tempest sneaking up on me. Yikes! 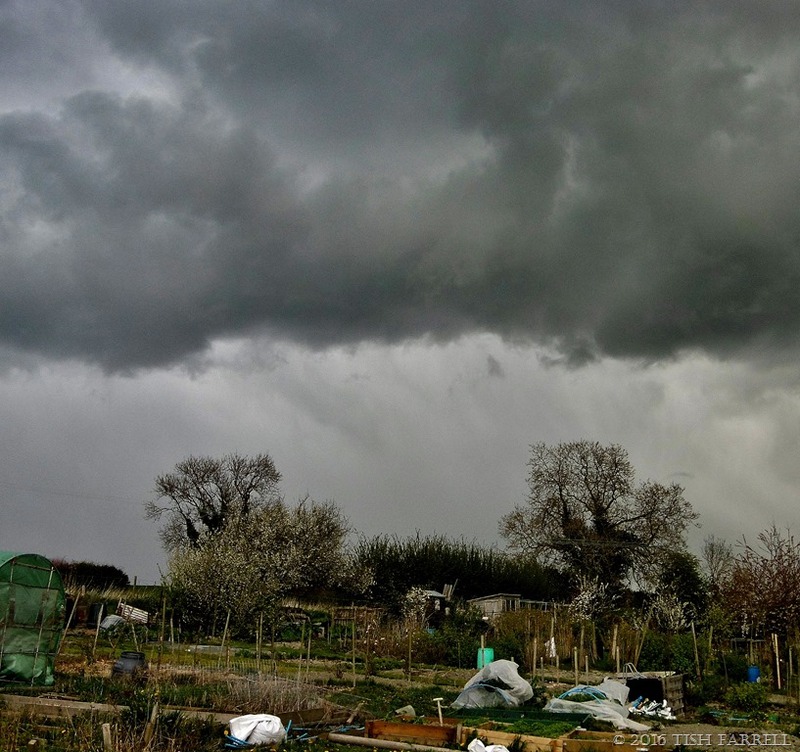 By the time I had scooted across the plot to the shelter of my polytunnel, we were having a small, but very concentrated snow and hail blizzard. It was far too stormy to think of making for home. 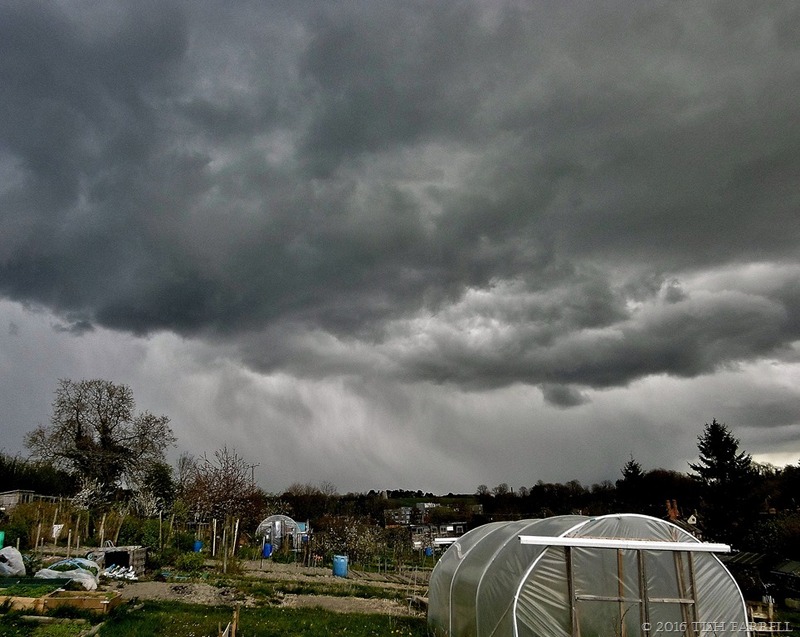 Instead, I pottered about in my tunnel sowing some purple Brussels sprouts seeds in modules, while trying to remain hopeful that this truly was a passing squall and not the heavens falling in as the heavyweight clouds suggested. I forgot to record the actual blizzard that followed, so here are some Précoce de Louviers pointy spring cabbages that are growing most happily in the tunnel. 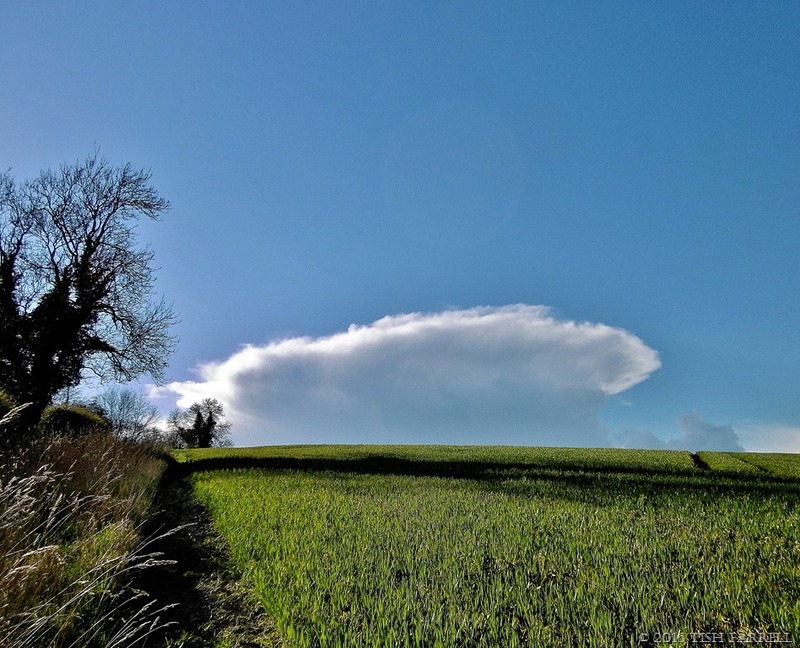 And when I stepped through the hedge into the wheat field behind our house, the sky looked as if butter wouldn’t melt in its mouth: snowstorm, what snowstorm? Thinking that just maybe it’s never too late to be a ‘poster girl’, and especially if some serious photo-editing is involved, I thought I’d give myself the Warhol treatment for this week’s Daily Post Photo Challenge. It’s perhaps also a metaphor for the state of me – spreading myself in too many directions at once. 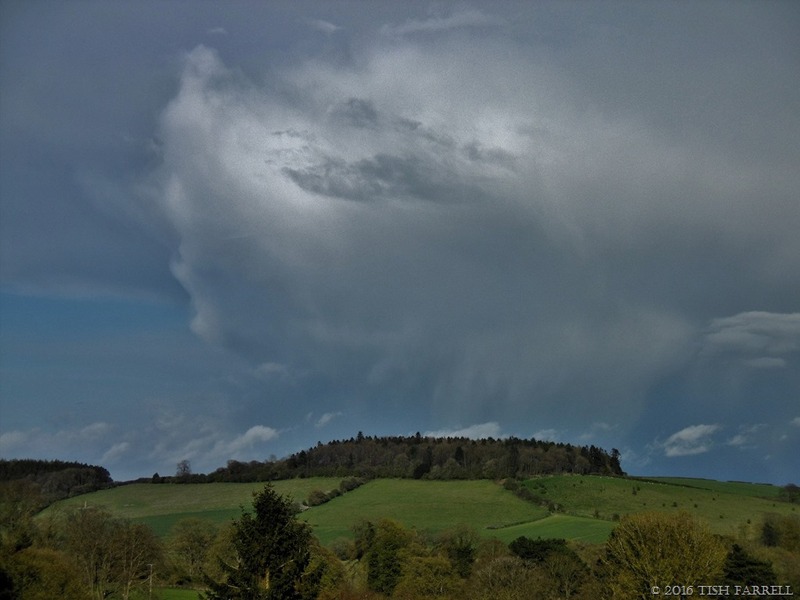 We Brits are renowned for an unbridled capacity to talk about the weather, and this month there has been so much of it, and sometimes all at once. In the Farrell household the question has been hourly batting back and forth between he and she who live in our house: have you seen the weather forecast? He has a major earth-moving project in the back garden – dismantling a raised bed, and sawing up next winter’s firewood supply since we keep using the logs that have already been chopped. She has a major earth-moving project up at the allotment – filling raised beds with a recycled compost mountain. 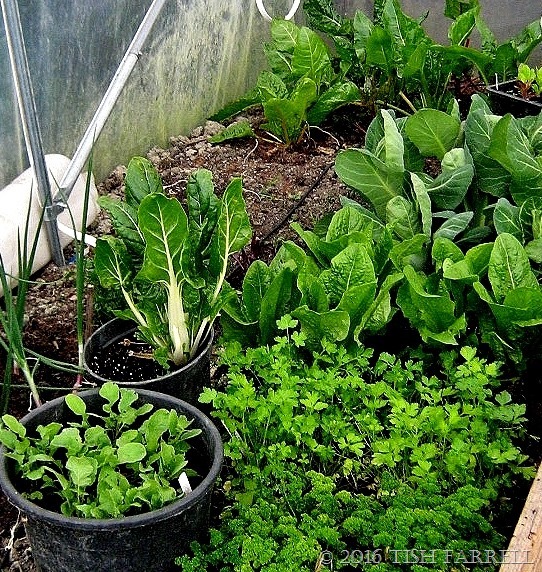 There is also seed sowing, hardening off and planting out of vegetables to consider, all of which are dependent on weather conditions in general, and knowing how long arctic winds and icy rain will last in particular. Oh well. Better hang on to the woolly hats and vests, wellies and waterproofs. Cardinal Guzman The Changing Seasons April 2016 Go here to see the Cardinal’s take on April, plus his rules for the challenge. Then join in! This week Paula’s theme at Black & White Sunday is rhapsody. This instantly made me think of George Butterworth whose promising career as a composer ended with a sniper’s bullet on the Somme in 1916. He is best known for his arrangements of English folk songs, and in 1911 and 1912 he set to music eleven of A E Housman’s A Shropshire Lad poems. In the recording at the link below you can hear a ten-minute melodic evocation of my home county. It begins with one of the songs, Loveliest of Trees. This leads into the full orchestral Rhapsody which widens our gaze to embrace wide blue vistas – music of landscape, and of love and loss. The photo was taken in the field behind our house. 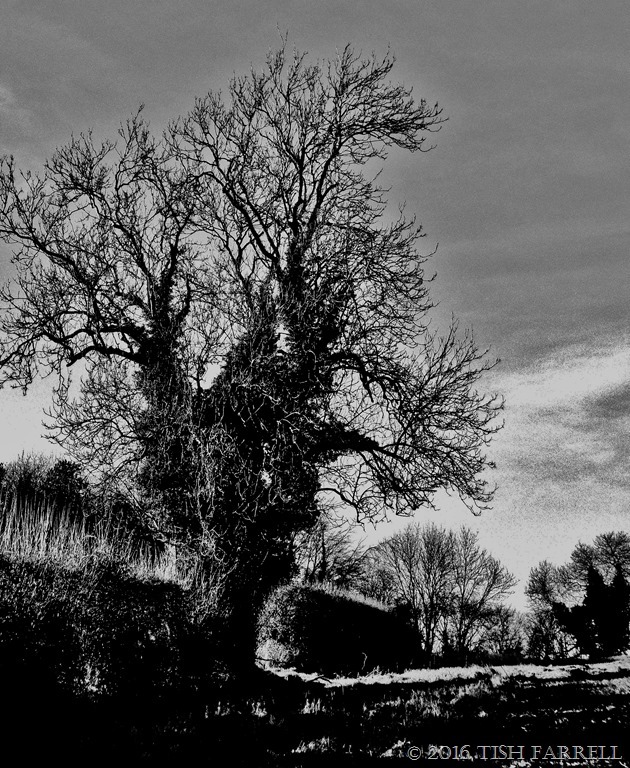 The tree is not a cherry as in the Butterworth-Housman song, but an ivy-clad ash. They thrive along Wenlock’s limestone Edge. 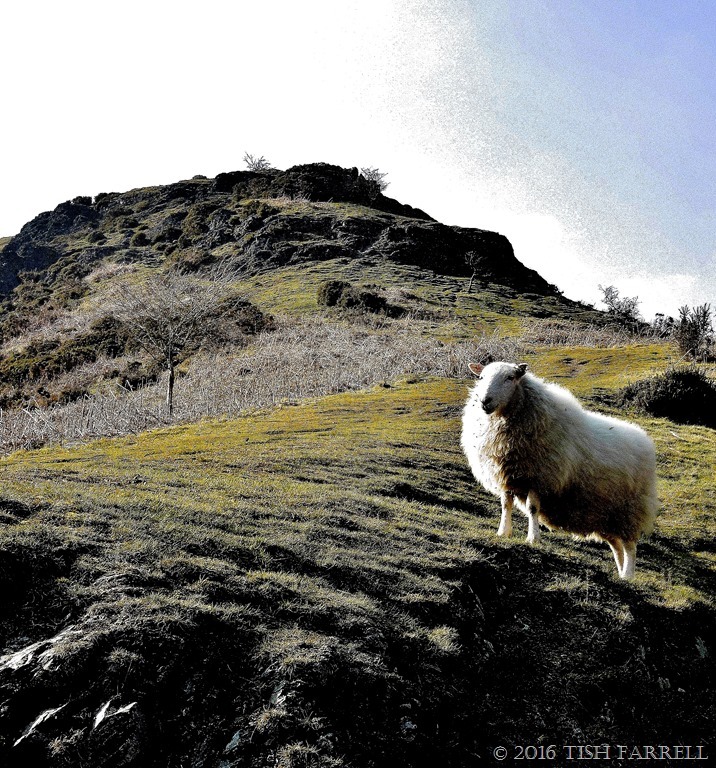 Not so much Monarch of the Glen as Sheep on the Long Mynd, a hill so old that it has some Pre-Cambrian geology named after it. I’m talking here of Longmyndian shales, siltstones and sandstones (sedimentary rocks) that were laid down in shallow seas at a time when this part of the earth was moving up the planet from Antarctica. This would be around 560-550 million years ago. 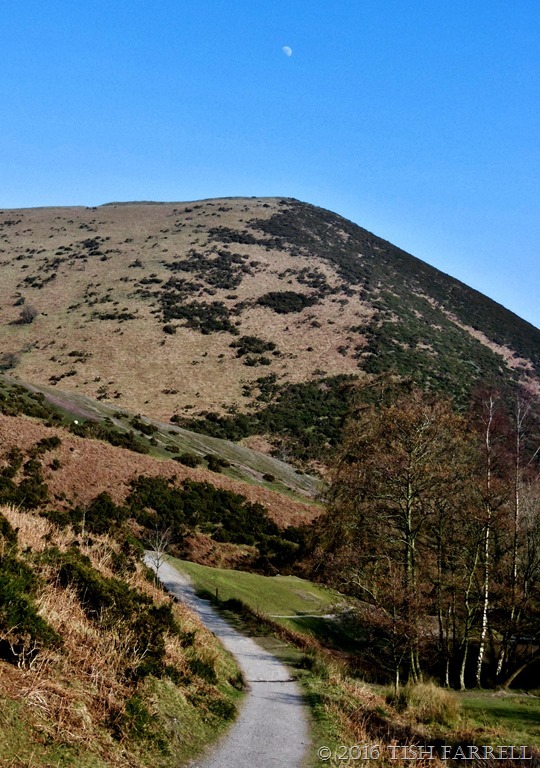 The Long Mynd (mynd means mountain in Welsh) lives up to its name too. It is a very long plateau with steep valleys, and was formed by a very big CRASH when sea levels fell and the seabed deposits collided with a plate of volcanic hills to the east. The result was the folding, tilting and compressing of the Longmyndian shales, siltstones and mudstones along the Church Stretton Fault. This was around 550-400 million years ago. The Longmynd then continued to be knocked into the shape we see today by the following Ice Ages when glaciers shunted around its flanks, making it an island amongst frigid wastes. When the ice finally began to retreat around 30,000 years ago, rain and melting snow fed streams that cut steep valleys or ‘batches’ into the Mynd’s sides. Isn’t geology wonderful when you forget about the hard words, the mind-boggling quantities of time, and just admire the consequences? 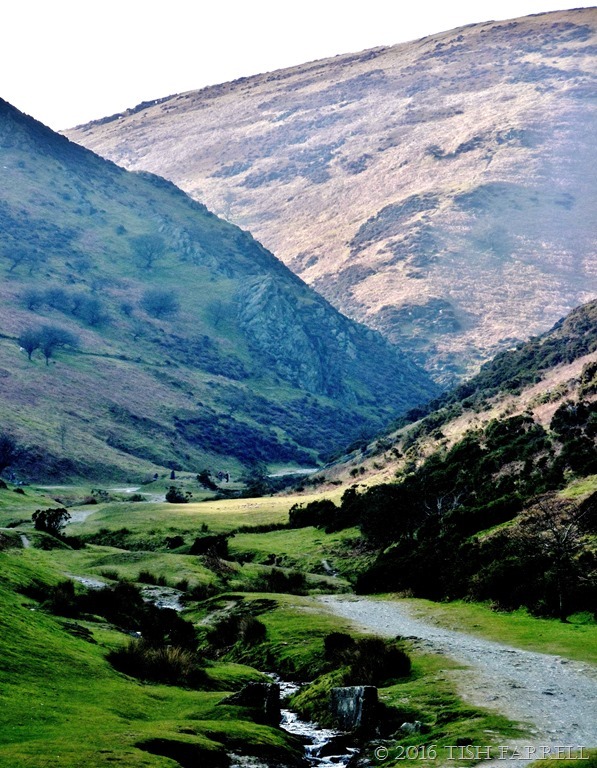 One of the Mynd’s best known features is Carding Mill Valley where these photos were taken. Since Victorian times it has been one of Shropshire’s most popular countryside resorts. 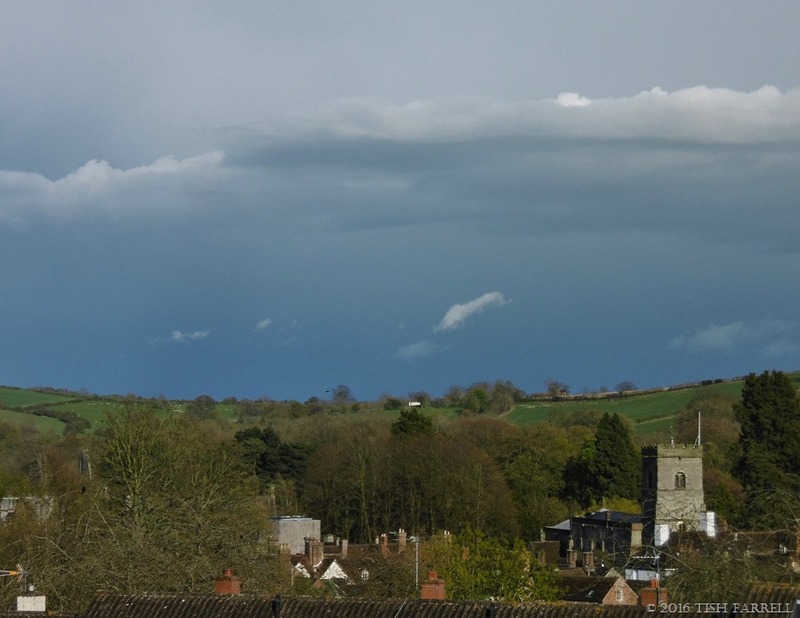 Generations of Salopians (Shropshire folk) will have fond childhood memories of spending Bank Holiday Mondays picnicking there, feeding egg sandwiches to the sheep, getting soaked in the stream, and going home with green bottoms from sliding down the hillsides. 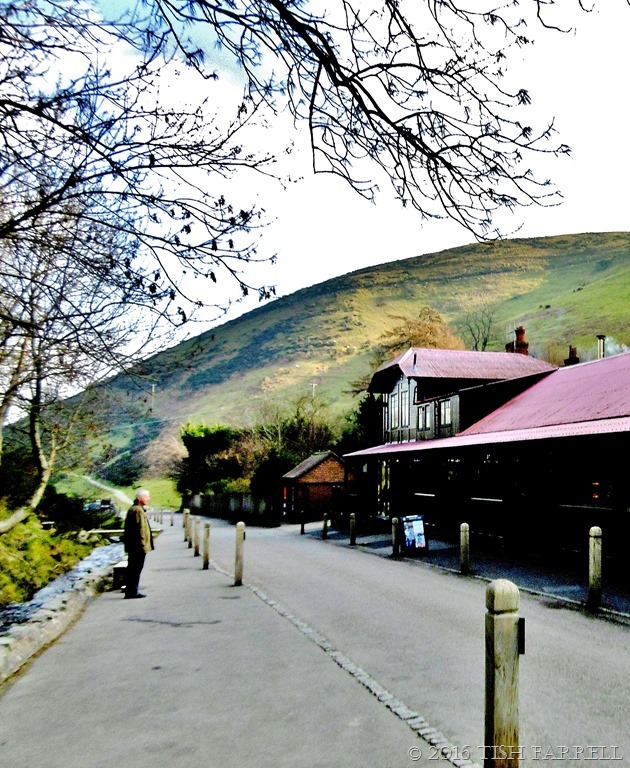 Today both valley and Long Mynd are in the guardianship of the National Trust that not only manages the landscape, but provides very excellent homemade refreshments in the Edwardian Pavilion tea-room that’s coming up next. If, while you are looking at that, you also scan towards the top of the hill, directly above the pavilion’s main roof, you might just discern the verge of a very hair-raising single-track road that takes you over the top of the Long Mynd to the small village of Rattlinghope, known locally as Ratchup. I have a grim memory of driving down there in a car with dodgy brakes, and only intermittent passing places beside precipitous drops. Unlike the geology, the landscape you see in the shots is not natural, but man-made. The valleys would once have been wooded. Archaeological finds from c 3,500-2000 BC indicate that Late Stone Age (Neolithic) people were travelling along the open top of the Long Mynd ridgeway, an ancient trade route between Cumbria in the north, Wales to the west, and Cornwall in the south-west. Earlier Mesolithic hunter-gatherers came this way too. But the main clearance probably took place during the Bronze Age (c.2,000-1,000 BC). These people farmed in the Shropshire Hills and buried their dead in cairns and burial mounds all along the ridgeway. In the next photo you can just see the green ramparts of the Iron Age hillfort Bodbury Rings. It is lying right along the hilltop skyline towards the summit, and ending directly under the moon. This was a summer herding camp of the Cornovii people, and dates from around 400 BC. We may not know very much about the past peoples who lived and died in this landscape, but they did leave behind clues that showed us that they honoured it in significantly sacred ways. That would be a good thing to remember on this Earth Day. Much of the world is in dire need of loving care. We are lucky in Shropshire to have so many people, and charitable bodies who do take care of the place for everyone’s pleasure and inspiration. I’m also linking this to Jo’s Monday Walk for when she’s regularly back with us. I think she would like this walk up Carding Mill Valley. 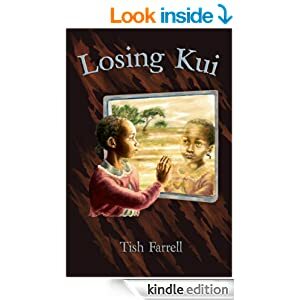 For this week’s Thursday’s Special Paula is asking us to focus on traces of the past. 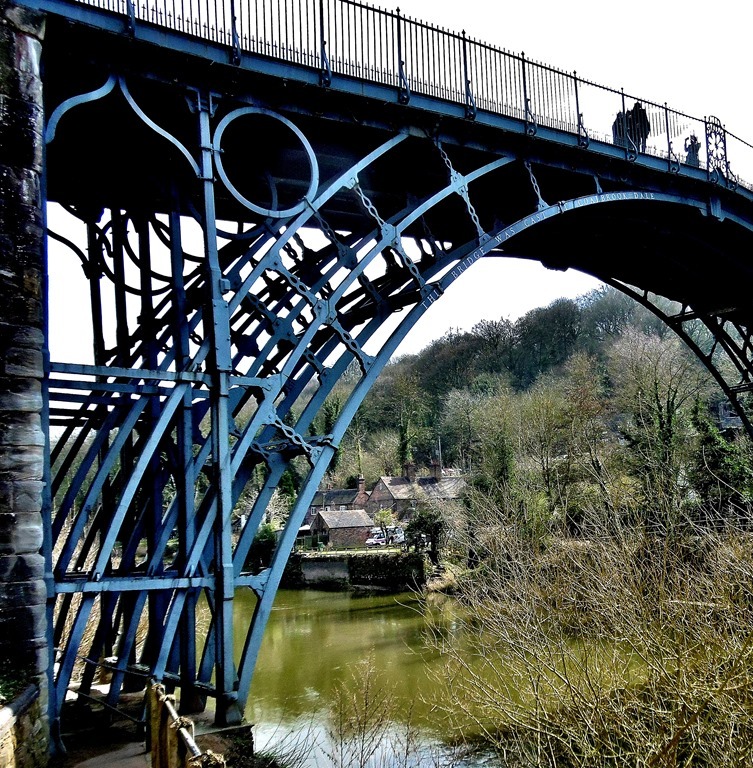 For those of you who have not seen my earlier posts on the Ironbridge Gorge, this bridge was the first to be made from cast iron, and in a single arch that spans the River Severn in Shropshire. It crosses the Severn Gorge just a few miles from my house, and is a World Heritage Site. The height of the bridge was dictated by Quaker Ironmaster, Abraham Darby’s desire to show off – not only to prove the versatility and potential of cast iron, but also to build the first bridge on the the Severn that would allow the river’s big sailing barges (Severn trows) to pass under with out lowering their sail masts. One up on all the river’s stone bridges then! And what a sales (sails) pitch it was too, for people to see his bridge with a fully rigged sailing barge passing beneath it. He also built the bridge in one of the most spectacular parts of the Gorge, and on the site of a treacherous ferry crossing. 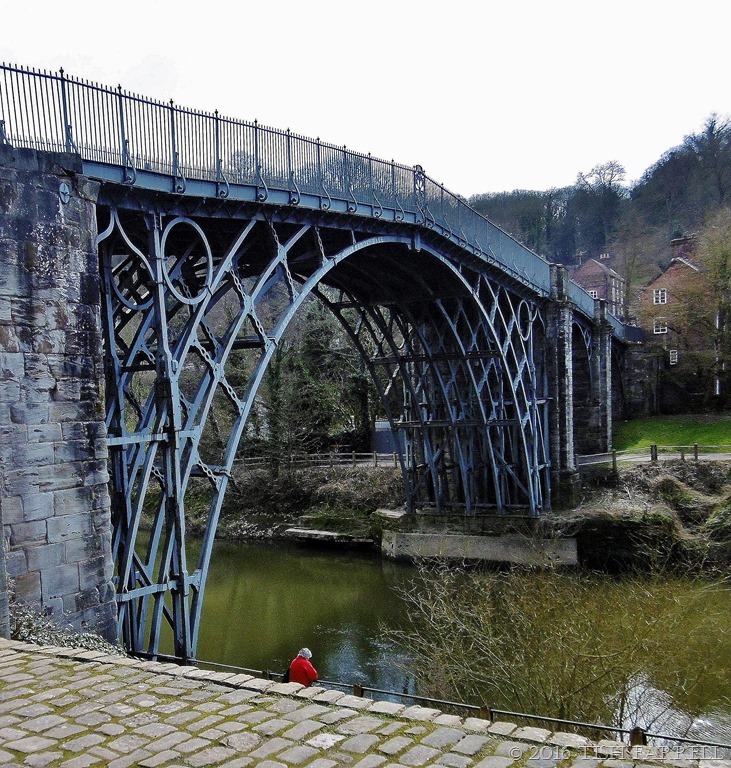 Before the bridge was built people had to cross between the two industrial settlements of Broseley and Coalbrookdale in a coracle, an ancient skin covered craft that was used by local poachers. The bridge itself is a curious construction. If you look closely at the iron framework you can see that although Abraham Darby was breaking new ground (and in its day the Iron Bridge was definitely a world wonder), the building techniques include the kind of joints that people would expect to see in carpentry: mortise and tenon joints and dovetails. It is hard to know if Darby was erring on the side of caution by sticking to tried and tested construction methods, or simply being innovative in ways that weren’t too innovative for people’s sensibilities. After all, one of the best ways to make people accept and welcome the new, is to start from something they already know and recognise. In such ways does the past follow us into the future. April and it’s all change. On Saturday I was whinging about the snow that had invaded our early morning landscape. By Sunday we were sitting coatless on Benthall Hall’s tea room terrace, and consuming carrot cake and hot chocolate with the sun on our faces. 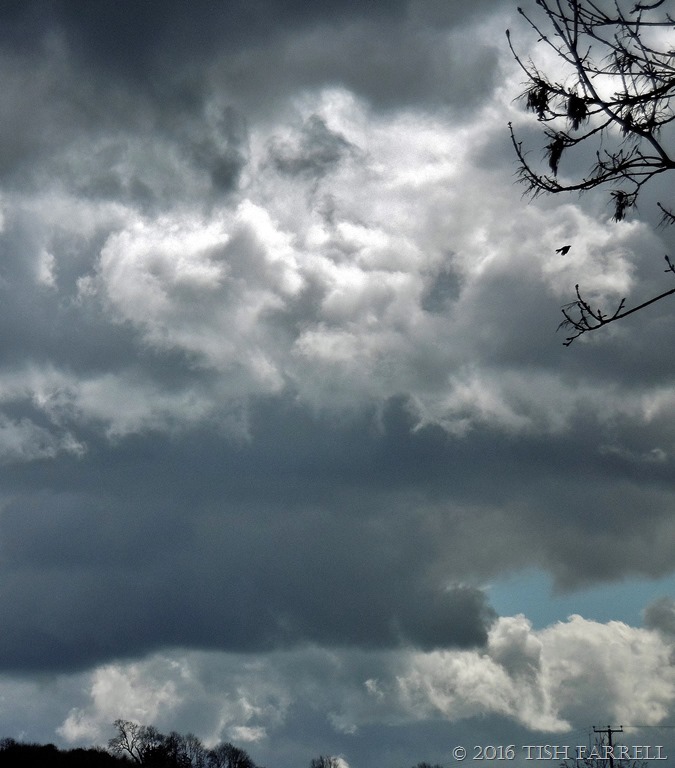 It was February when were last there, and grey and stormy, with no possibility of sitting outside. Now we were in danger of overheating with a nice grey hen pootling around our feet, and the air filled with bee-hum. 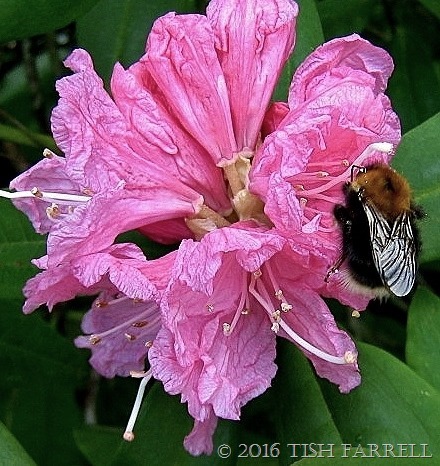 Later, when we ambled around the gardens, we came upon these newly opened rhododendron flowers and a very happy bumble bee. To say it was gorging itself is an understatement. Up to its armpits in pollen it was. Food at last. Bzzzzzzz. Check in at Cee’s Flower of the Day for more floral displays. You can step back through time on Wenlock Edge. The trackways across the ridge-top have doubtless been trodden by itinerant traders since Stone Age times. 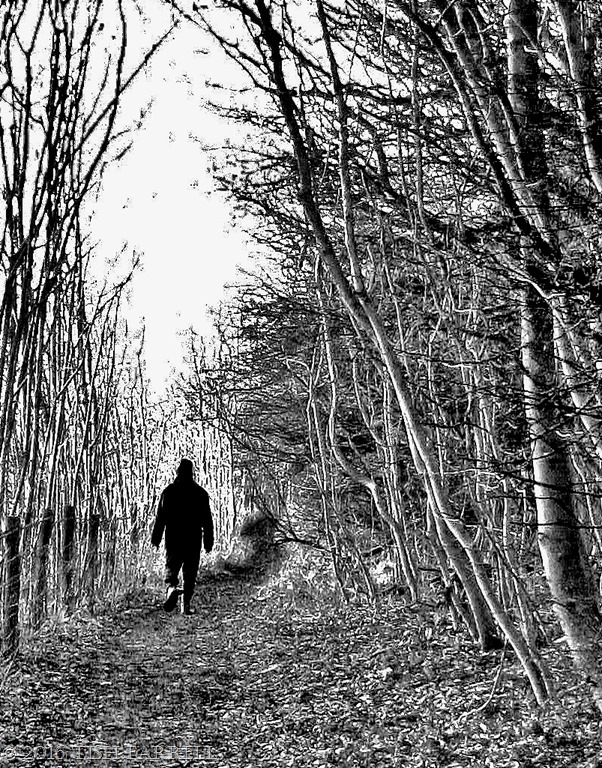 In fact if I didn’t know that the lone figure on the path ahead of me was Graham, I might tell you that this is the shade of a six thousand year-old stone axe merchant, or a four thousand year-old Bronze Age smith. Or closer to our time, say two thousand two hundred years ago, it could be an Iron Age farmer trekking through the woods. There are also traces of Roman farms either side the Edge, and from the Middle Ages until modern times the limestone from which the Edge is formed would have been quarried for building and for iron making, and also burned in kilns to make lime mortar and fertilizer. And then there is the 400 million year geological history of the Edge itself – starting in times before fish had evolved, let alone mammals. (I won’t mention the four foot long giant water scorpions that lived back then). But landscape as a portal to the past – it’s an intriguing notion. This week at Black & White Sunday Paula’s guest, Lisa Dorenfest, gives us the theme of ONE. 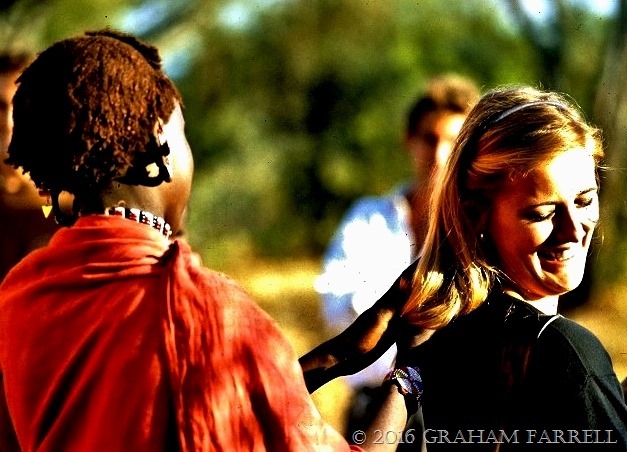 Please go and see her stunning photo, and Paula’s own response to the challenge. Even if I say so myself, with radishes as beautiful as these, you can see why Mother of Rapunzel so craved them that she sent poor Father of Rapunzel scrabbling over the witch woman’s garden wall on nightly radish-scrumping missions. We all know what trouble that led to, and hopefully there will be no similar repercussions (whether the enforced letting down of over-long hair from tall towers or the scratching out of princely eyes ) from eating these dear little Cherry Belle radishes. Because eaten them we have. They took pride of place in the salad that accompanied Friday night’s dinner. Apologies to Robert Burns for the radish intrusion. 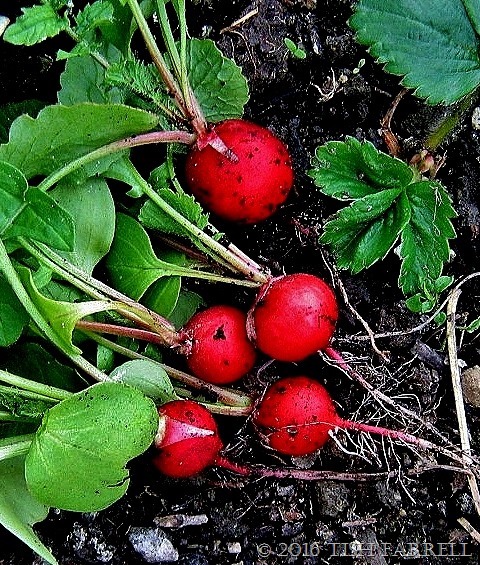 Also I don’t think Jude has yet featured radishes in her April garden close-ups challenge.